What is PC Security 2011? Steer well clear of PC Security 2011. This harmful and seditious rogue antispyware application is a fake security tool only out to fleece you out of your money. PC Security 2011 does not own the ability to diagnose, quarantine or remove any threats from your PC, and is nothing more than a harmful infection itself. Many users continue to fall prey to the deceitful lies of PC Security 2011, and many of its victims claimed they didn’t even know how PC Security 2011 infiltrated their systems. PC Security 2011 is distributed via bundled Trojan and malware downloads from third party websites, as well as criminal websites which market this rogue. These illicit websites are generally browser hijackers and will make use of drive-by downloads to infect its victims. Users infected by PC Security 2011 reported on being unable to connect to the Internet, and complained of poor system performance and increased erratic system behaviour. Others reported randomly generated and deleted Desktop items, and the inability to launch legitimate executables. Do not be fooled by the over hyped promises made by this incredulous rogue. 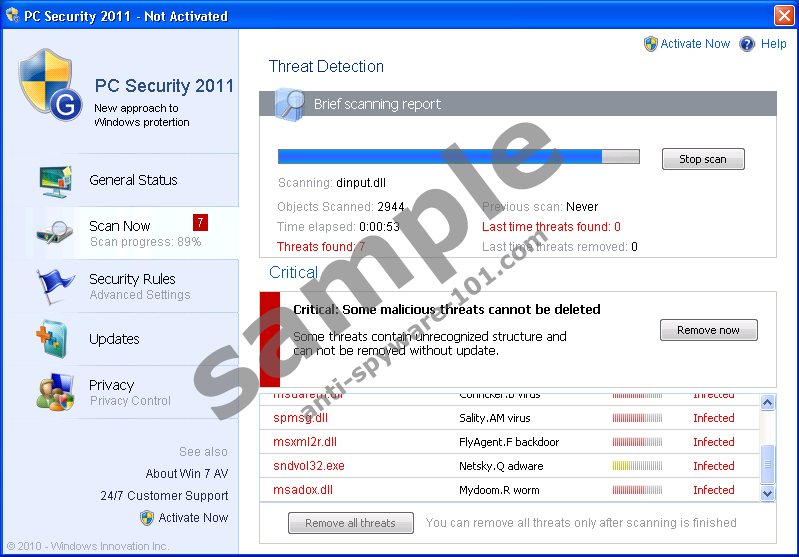 Take back control of your system and remove PC Security 2011 for good.